Last year, I introduced a whole new genre of novels: the Make Your Own Ending (or Interactive Fiction) concept. I now have a box full of those books where you come to a page as the reader/character, are faced with a decision, make a choice, and move on through a certain branch of the story. The students LOVE these books and many have not ever encountered them before (which seems odd to me, but there was a time when the publishers stopped publishing, and that seems to now have been reversed). The key is not just the reading, but the writing of these stories. Yesterday, I brought two of my classes into the freeware called Twine, which allows you to construct and build interactive fiction stories. They are now working on an archeological-themed project called “The Mystery of the Ruins” in which they will be writing and publishing their own stories. There was so much laughter and discovery yesterday as I told them “to play” with the software and not worry about the project. Just go on and make something. Make a story, build branches and see what works and what doesn’t work. Ask questions. We don’t do this enough — give time to play with technology — but it remains a very crucial element in my classroom, and now, as we gear our way forward later week to actually writing the real story, they will have some understanding of the strengths and weaknesses of Twine. They will have some ownership of the process, and not be quite as hemmed in. This entry was posted in Interactive Fiction, Slice of Life, Technology Resources. Bookmark the permalink. Twine?!?! I’m intrigued…I haven’t heard of this and now I’m looking forward to exploring with it. I loved those books when I was a kid. Where did you find all of your copies? Happy writing! We had some extra book money last year, so I ordered about 40 copies of these books. You can find them anywhere now, as they have begun to update and republish them. 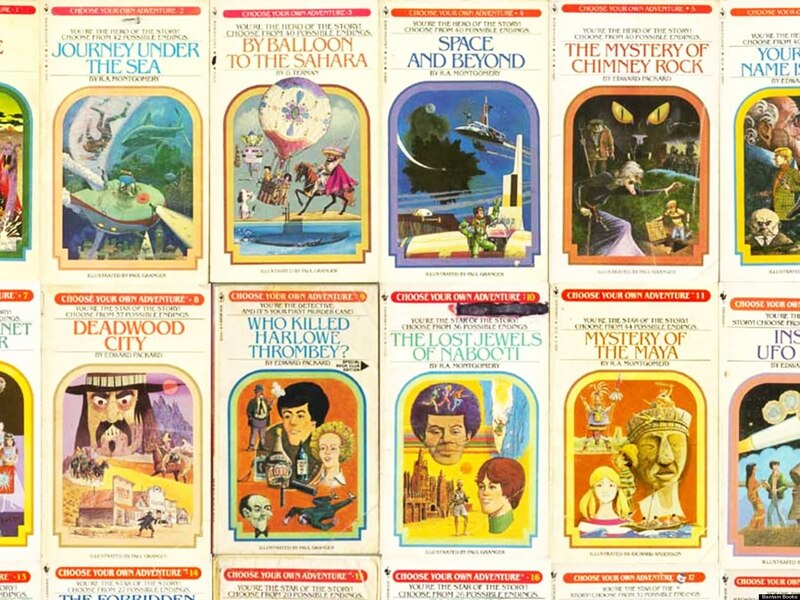 On another note – I worked on those Choose Your Adventure books when I first started working in publishing…memories! Memoirs as branching stories? Brilliant. I need to remember that. What a great app. How do you keep finding this stuff! I can see why kids love this. It promotes such if, then thinking! What a great year end fun. I read a lot. 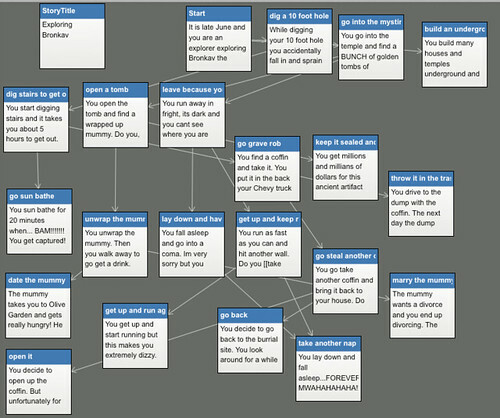 Actually, last year, I did all sorts of exploration myself with interactive fiction, which led to me to Twine. It’s that “deep dive driven by interest” that becomes an anchor of learning. I so agree with letting them ‘play’ with technology. We are working on informational writing (and integrating it into “Explorers”). Yesterday we spent our Social Studies time searching for and trying out ways to create text features. We have a Google Doc of the things they found with annotations of what they liked and why, as well as what they wish something could do. The tools they play with are the ones they will remember and use! I agree with that. Funny how your exploration is both literal and figurative, Kristi.